A combination of various art forms - beading, painting, embroidery and applique. A three dimensional quilt with lots of textures created by using leather, fabric, beads, wool. The painted faces are inlaid on a earthy brown background with a second layer of faces with a cream fringed effect layered on top. 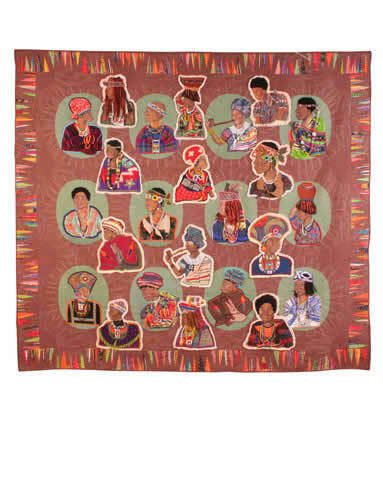 The work is quilted in a sunrise motive reminding of the warmth and colour of the African sun. The sun ray border brings the whole work together. Inspiration for the border from Linda Sullivan.